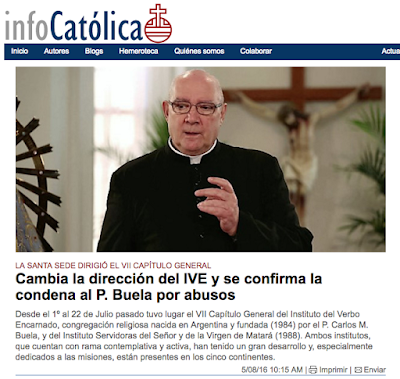 The reputable Spanish-language Catholic Press site InfoCatolica confirms that Institute of the Incarnate Word and SSVM founder Carlos Buela was sentenced by the Vatican (first by Pope Benedict, then again by Pope Francis) due to sexual abuse of seminarians, supporting the points we made eight months ago in our post here. The article also says that the Vatican prohibited the Superior General or any provincial leaders from being re-elected to their posts. This is probably because the superiors in question (and likely others as well) knew of Buela’s sexual abuses, yet covered up and lied about them. In fact, they even continued to allow Buela access to IVE seminaries and seminarians until as late as the summer of 2013, a year after Benedict’s sentence and three years after Buela’s resignation. This proven participation in the denial and coverup makes the IVE leadership complicit in Buela's abuse. We mention all this because it illustrates the culture of dysfunction and abuse Buela established at the IVE & SSVM that we have highlighted and will continue to expose on this site. Unfortunately, the lies and abuse extend well beyond this set of leaders. Anyone still in or considering these groups is at risk. These steps will not undo damage already done, but will prevent others from falling victim. They would be uncharacteristic steps for Buela or Walker, but we hope the new IVE/SSVM leadership is willing to abandon it’s previous ways and embrace Truth in order to protect the young faithful seeking to serve Christ's Church. Discerners, family, Ex-IVE and Ex-SSVM we are here to help.